Join a culinary adventure on your European river cruise with unforgettable views along the Rhine and Rhône Rivers. Enjoy special excursions and activities to highlight great regional cuisine and wine. Enjoy the landscapes of Burgundy and Provence to sample the best food and wine in Lyon and Viviers. Your culinary cruise also includes a pastry demonstration; a chocolate, cheese, and wine tasting; and a food-and-wine pairing dinner hosted by your Master of Wine on board. Begin with a guided canal cruise through Amsterdam’s iconic waterways, then cruise on the Rhine River to Cologne—with its gothic cathedral and soaring twin steeples. Take a guided tour of the city or a walking tour of Cologne’s historical Jewish sites. Sail through the spectacular Rhine Gorge on your way to Rüdesheim and visit the marvelous Siegfried’s Mechanical Music Museum. Continue to Mainz and visit the Gutenberg printing museum or magnificent Heidelberg Castle. 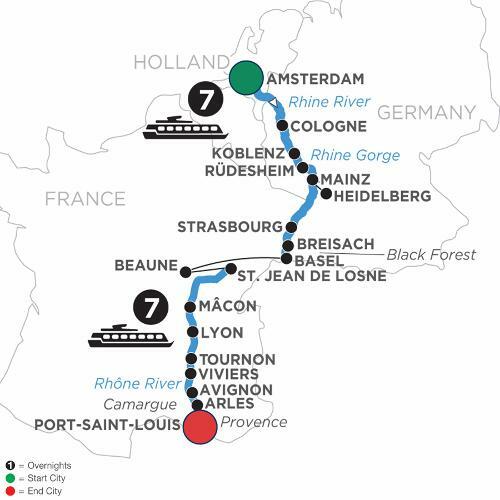 Explore La Petite France District in Strasbourg, and sail to Breisach, Germany, gateway to the Black Forest. Visit the largest wine producer in Europe at Badischer Winzerkeller winemakers, and taste wines in the vineyards of Baden. Alternatively, spend a day in the Black Forest. In France, see Beaune’s Hotel-Dieu Charity Hospital, home of Van der Weyden’s “The Last Judgement.” Sail to the Chardonnay wine region of Mâcon, with cheese tasting on board. Explore Lyon, France’s gastronomic capital, and sample local French food on a guided culinary walk. Nestled among vineyards are the twin cities of Tournon and Tain l’Hermitage. Take a guided walk through the Roman ruins in Tournon. Visit charming Viviers and historical Avignon. See the 1st-century Roman amphitheater still used today in Arles on the Rhône River, and join a painting workshop in the style of Van Gogh whose work was inspired here. Your French river cruise concludes in Port-Saint-Louis.